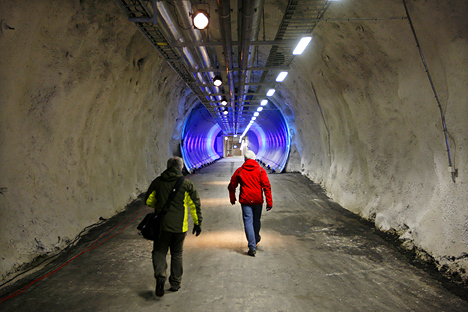 The high-security vault, almost half the length of a football field, will be carved into a mountain on a remote island above the Arctic Circle. If the looming fences, motion detectors and steel airlock doors are not disincentive enough for anyone hoping to breach the facility’s concrete interior, the polar bears roaming outside should help. The more than 100 nations that have collectively endorsed the vault’s construction say it will be the most secure facility of its kind in the world. Given the stakes, they agree, nothing less would do. Its precious contents? Seeds – millions and millions of them – from virtually every variety of food on the planet. Crop seeds are the source of human sustenance, the product of 10,000 years of selective breeding dating from the dawn of agriculture. The “doomsday vault,” as some have come to call it, is to be the ultimate backup in the event of a global catastrophe – the go-to place after an asteroid hit or nuclear or biowarfare holocaust so that, difficult as those times would be, humankind would not have to start again from scratch. Once just a dream – albeit a dark one, attractive only in comparison to the nightmare that would precede its use – this planetary larder is about to become a reality. Today, on the barren Norwegian outpost of Svalbard, the prime ministers of five nations and other officials will lay the cornerstone for what will be the Fort Knox of seeds. “We will have the biological foundation for all of agriculture, which is really saying something,” said Cary Fowler, executive secretary of the Global Crop Diversity Trust, the international organization coordinating the vault’s creation with the Norwegian government. If progress continues during the short building season this summer and next, the high-tech cavern will start accepting deposits from smaller seed banks and agricultural and scientific organizations by fall 2007 under the terms of an international treaty that took effect two years ago. Then, with a loud clank and the sound of sucking air, the door will close. And the Svalbard International Seed Vault will slip into a subzero slumber – an insurance policy for human civilization. Scientists estimate there are 2 million varieties of plants used for food and forage today. That includes an astonishing 100,000 varieties of rice, the major staple of the human diet, and more than 1,000 varieties of banana. Seeds from food crops, which can be smaller than poppy seeds and as large as coconuts, are invaluable repositories of plant DNA. They are the raw material that farmers and researchers rely on to develop more productive and nutritious plants that can cope with climate change, new diseases or pests. The design, described in a recently released feasibility study, bespeaks that Armageddon mentality. First, there is the location: The starkly beautiful and always-frozen terrain of Svalbard is, to say the least, off the beaten track. Home mostly to a small community of scientists, coal miners and support staff, it is the northernmost place in the world with scheduled commercial air service. Arctic foxes, reindeer and polar bears stroll the streets. Yet it has the basic infrastructure that’s needed, including a modest network of roads and an electrical generating plant fed by local coal. Plans call for a cavern about 50 yards long, 15 feet wide and 15 feet high. Although it will be built in solid rock, its floor, ceiling and walls will be lined with 3-foot-thick layers of high-quality insulating concrete. The door will be opened only once or twice a year, to check contents and add new varieties. Air-handling equipment will bring in outdoor air during the winter, when temperatures hover around minus 30 degrees. Refrigeration units will be available to keep interior temperatures cold during Svalbard’s summer. The vault is one of many strategies being implemented in sync with the International Treaty on Plant Genetic Resources for Food and Agriculture, which came into force in 2004 and has been ratified by more than 100 nations. The United States has signed the treaty, but the Senate has not ratified it. Already, Fowler said, CGIAR has promised to contribute samples from its huge network of banks, which hold about 600,000 varieties. And the U.S. Department of Agriculture, which oversees the nation’s largest seed collection in Fort Collins, Colo., will add holdings that are not in the CGIAR collection, he said. “This facility will provide a practical means to reestablish crops obliterated by major disasters,” Cary Fowler, the trust’s executive secretary and lead writer of a study that led to the creation of the vault, said in an e-mailed statement. “Crop diversity is imperiled not just by a cataclysmic event, such as a nuclear war, but also by natural disasters, accidents, mismanagement, and short-sighted budget cuts.” The samples will be held in “black boxes” that will only be released in the event that all other seed sources have been destroyed or exhausted, according to the trust. 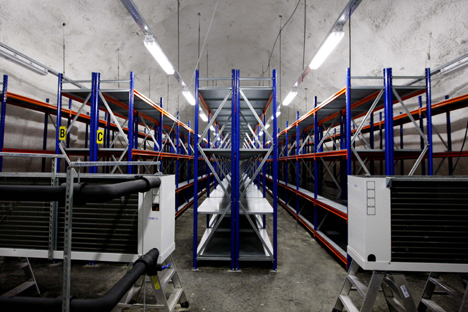 The choice of Svalbard to host the vault means that even if refrigeration systems fail, the seeds will be protected because of the Arctic island’s permafrost, the trust said. “Arctic permafrost will act as a natural coolant to protect the samples, which will be stored in watertight foil packages, should a power failure disable refrigeration systems,” the trust said. “Despite changes being wrought by global warming, experts believe the deep permafrost will be reliably cool for at least the next 100 years. 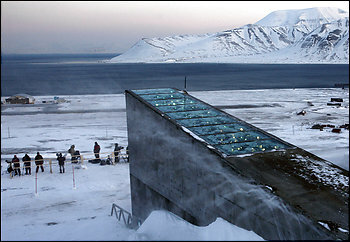 Even with a complete loss of refrigeration, vault temperatures would never rise above minus 3.5 Celsius or about 27 degrees Fahrenheit.” The Svalbard vault will be kept secure by a meter (3 feet) of reinforced concrete and a perimeter fence, as well as the remoteness of the island itself, according to the trust. Fowler’s study concluded that seeds for most major crops could survive for “hundreds” of years, and some grain samples may remain viable for “thousands” of years in the vault. “Prior to joining the Trust as its Executive Secretary, Dr. Cary Fowler was Professor and Director of Research in the Department for International Environment & Development Studies at the Norwegian University of Life Sciences. He was also a Senior Advisor to the Director General of the International Plant Genetic Resources Institute. In this latter role, he represented the Future Harvest Centres of the Consultative Group on International Agricultural Research in negotiations on the International Treaty on Plant Genetic Resources. I am pleased to mark the Norwegian Government’s recent decision to build a global seed bank, which will be built into the mountainside behind us. This facility holds a promise for the future. It will safeguard an invaluable treasure. This seed bank is of global importance. It will be the only one of its kind. All other gene banks are commercial. This storage facility is being built with a long-term perspective. It is our final safety net. If seeds stored in a commercial gene bank are destroyed – and this has apparently happened about 40 times to date – the contents of this gene bank will make it possible to replace the seeds which have been lost. This seed bank is important to ensure food security. The main aim is to protect the seeds of plants that are important for food and agricultural purposes. This seed bank is important in regard to environmental considerations. Along with climate change, the loss of biological diversity is among the greatest global environmental challenges we presently face. This facility will be large enough to hold all known varieties of food plants. This seed bank is important due to cultural considerations. Many of the seed varieties being lost today are no longer used in food production. They are nonetheless valuable and worth protecting, both because they inform us about our cultural heritage, and because some have characteristics no longer found among seed varieties in use today. Preserving these seeds is therefore a means of safeguarding future development opportunities. And last, but by no means least, this seed bank is especially important for developing countries. Although they enjoy great biological diversity, developing countries have the poorest storage facilities and suffer the greatest resource losses today. Norway has decided to build this facility now because global and national parties have indicated its necessity, and their desire to use it. The Nordic Gene Bank has been contributing to the preservation and documentation of food and cultivated plants from all of the Nordic countries for 25 years. Today, the initiative also covers other countries, stretching from the Baltic to Africa. The Global Seed Bank opens up a new dimension in Nordic cooperation, in that the Nordic Gene Bank will be responsible for running the project. RELATED : CURE FOR CHRISTIANITY?